The soft whisper of the waves and bohemian nights are just some of the charming things that the seductive destination of Puerto Vallarta has to offer. It is a fantastic place to bear witness to some of the small, yet impressive miracles of nature, such as the passing of dolphins, orcas, whales, and sea lions through the waters here. While the above is a matter of luck as to whether you see them or not, what is planned for and expected punctually every year is the arrival of the turtles to Banderas Bay between the months of July and December. Of the eight species of sea turtles in the world, seven lay their eggs on Mexican soil, with the Olive Ridley sea turtle and the leatherback sea turtle on beaches in Banderas Bay. The sea turtle has existed on the planet since the Triassic period, at least 220 million years ago; but nowadays, it is classified as a species on its way to extinction. Fortunately tourists and local populations have been educated and are more conscious of the need to protect and conserve these precious reptiles. Today, the beaches, which some of the main attractions in Puerto Vallarta, have become a secure place for the turtles to lay their eggs, thanks to the effort of the locals, the hoteliers and ecological groups in the area. Here these cute creatures are respected and cared for. The process starts with groups of people who detect and protect the eggs by marking where the nests are, to avoid them getting stepped on or stolen. Those who get to see the moment when the turtles come to lay their eggs can't help but fall in love with these noble specimens. During the egg-laying process of the sea turtles, everyone is asked not to disturb the mother. As soon at the eggs start to hatch, the release of the sea turtles into the ocean is organized, generally at dusk. The atmosphere that reigns supreme is a mix of happiness, kindness, and, above all, a deep desire to s ee these little creatures make it to adult life; given that only one in a thousand will survive the predators and dangers of the open sea. This is why it has become a tradition to give each one a name, and wish it the best of luck before releasing it into the Pacific Ocean. 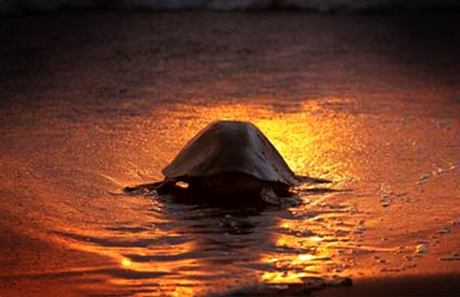 Come, discover and participate in the release of the turtles, and be part of their survival. You too can make a difference!